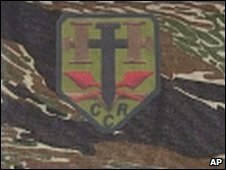 Hutaree's logo includes the initials CCR - for "Colonial Christian Republic"
Nine alleged members of a radical US Christian militia group have been charged with conspiring to kill police officers and wage war against the US. The suspects were detained in a series of FBI raids across the Mid-West, while one remains at large. Prosecutors say the eight men and one woman belonged to the Hutaree group. It is alleged they planned to kill a police officer in Michigan and then stage a second attack on the funeral, using landmines and roadside bombs. The FBI raided properties in Michigan, Ohio and Indiana over the weekend in the belief that the group was planning a reconnaissance exercise. "The indictment... outlines an insidious plan by anti-government extremists to murder a law enforcement officer in order to lure police from across the nation to the funeral where they would be attacked with explosive devices," said Attorney General Eric Holder. "Thankfully, this alleged plot has been thwarted and a severe blow has been dealt to a dangerous organisation that today stands accused of conspiring to levy war against the United States." A website in the name of the group shows video footage of military-style training exercises and describes Hutaree as "Christian warriors". It is edited to a backing track of rock music. A statement on the website says the group are preparing to defend themselves upon the arrival of the Antichrist. The website says Hutaree is "preparing for the end time battles to keep the testimony of Jesus Christ alive". In the indictment, Hutaree is described as an "anti-government extremist organisation" advocating violence against the police.